A thin layer of thatch will insulate the lawn, protecting the roots from high heat, and will aid in water retention. But when the buildup becomes too thick, more than 1/2 inch, it becomes an unhealthy element for the lawn. The roots will grow in the thatch and not make it to the dirt below, which will limit the ability of the grass to take in enough water and limiting its resistance to drought. You should check for excessive thatch buildup every fall as the weather begins to cool and the rains stop. 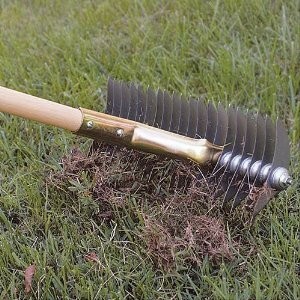 For small thatch buildups, rake the lawn with a gardening rake or thatching rake. Use a mechanical dethatcher when the thatch buildup is more than one inch. Dethatch during warm, but not hot weather, in the early spring or fall. 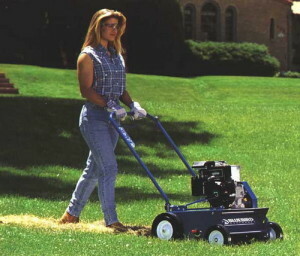 Aerate the lawn every two or three years. Dethatching your lawn improves its overall health. When you dethatch, you actually cut through the thatch with knife-like blades and then removing the debris. It is a combing like operation in which you comb out the debris. You can buy what’s called a thatching rake, which has knifelike blades rather than normal tines. You vigorously rake the lawn to remove the thatch, but it’s hard work and practical only for small lawns. Water and fertilize the lawn (according to your soil test results).Dethatching is pretty stressful on a lawn, and it can be on you, too. The lawn ends up looking pretty ratty, but if you dethatch at the right time, the lawn recovers quickly and fills in.